This large entolomatoid mushroom is fond of hardwoods, and can be recognized by its fairly large stature (often reminiscent of a Tricholoma), the yellow-brown cap that does not develop a prominently lined margin, the finely lined white stem, and the mealy odor. Crucial microscopic features include 5- to 6-sided, heterodiametric spores; intracellular pigment in the pileipellis; the absence of hymenial cystidia; and the presence of clamp connections. Entoloma lividoalbum is a European species. In North America it (or a closely related, as-yet unnamed species) occurs in the west, from the Rocky Mountains to the Pacific. Ecology: Saprobic; growing alone, scattered, or gregariously under hardwoods, but occasionally reported under conifers (the illustrated collection was made under quaking aspen, blue spruce, and Douglas-fir); summer and fall (and over winter in coastal California); fairly widely distributed west of the Great Plains. The illustrated and described collection is from Colorado. Cap: 5-7 cm; conico-convex to bell-shaped or convex at first, becoming broadly convex, broadly bell-shaped, or nearly flat; greasy when fresh; bald; yellow-brown, fading with age; the margin not lined or only faintly lined at maturity. 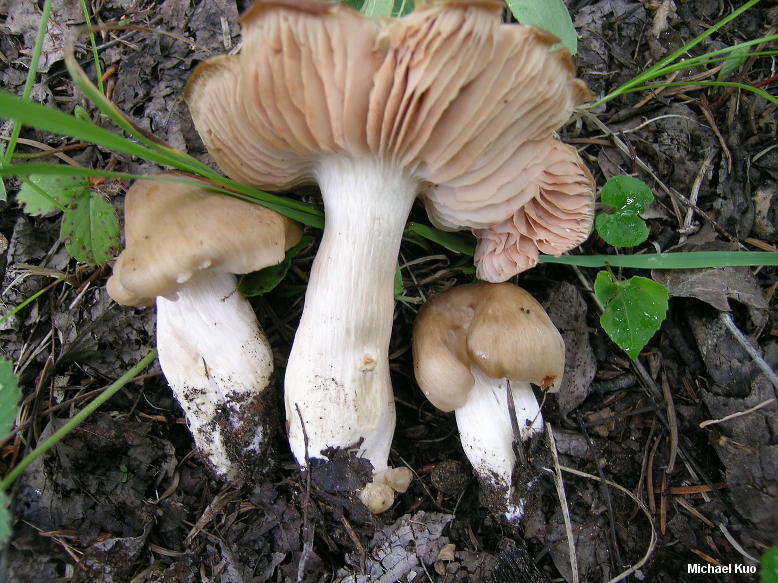 Gills: Narrowly attached to the stem; close or nearly distant; at first white, becoming pink with maturity. Stem: 5-8 cm long; 1-2 cm thick; more or less equal; dry; bald but finely lined longitudinally; white, often discoloring and bruising brownish near the base. 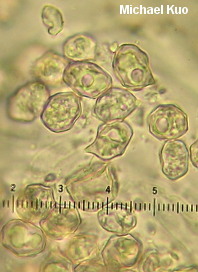 Microscopic Features: Spores 8-10 x 6-7 µ; mostly 5- and 6-sided; heterodiametric; smooth. Hymenial cystidia absent. Pileipellis a cutis with intracellular brownish pigment. Clamp connections present. REFERENCES: (Kühner & Romagnesi, 1954) Kubicka, 1975. (Noordeloos, 1988; Largent, 1994; Breitenbach & Kränzlin, 1995; Evenson, 1997; Miller & Miller, 2006; Noordeloos, 2008.) Herb. Kuo 08150712.